Drawing from a multitude of influences ranging from elegant classical and jazz styles to the rawest, most basic blues, country and soul, Radoslav Lorković has taken on an unusually broad musical spectrum and refined it into his distinctive piano style. His tenure on the R&B and folk circuits has culminated in five critically acclaimed solo recordings and numerous appearances on the recordings of and performances with artists including Odetta, Jimmy LaFave, Ribbon of Highway Woody Guthrie Tribute, Greg Brown, Richard Shindell, Ellis Paul, Ronny Cox, Dave Moore, Andy White and Bo Ramsey. His thirty-year touring career has led him from the taverns of the upper Mississippi River to the castles of Italy, The Canary Islands, The Yup’ik villages of Alaska, The Kennedy Center and Carnegie Hall. Born in Zagreb, Croatia in 1958, Lorković’s initial exposure to music can be attributed to two grandmothers. Antonija, his maternal Grandmother, sang him Croatian, Slovenian and Czech folk songs since birth. At age one he was reported to be singing back on pitch. By age three he was putting on floor shows for his grandfather and friends who would respond by showering him with coins yelling “pivaj Radoslav pivaj!” During this time classical music played in the home constantly due to the influence of his paternal grandmother Melita Lorković, an internationally renowned classical pianist. 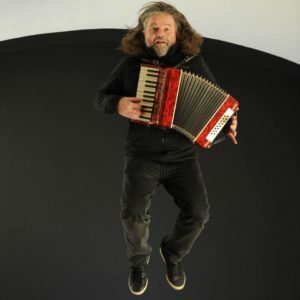 After this blend of central European musical influences, Radoslav moved to the United States at age six. He had a foothold on a classical music career when at age fourteen he was sidetracked by a blues scale that a friend had taught him.